Deputy Central Bank Governor S.R.Attygalle was questioned as to who should be held responsible for the expenditures made by the Treasury without following the due processes and laws. 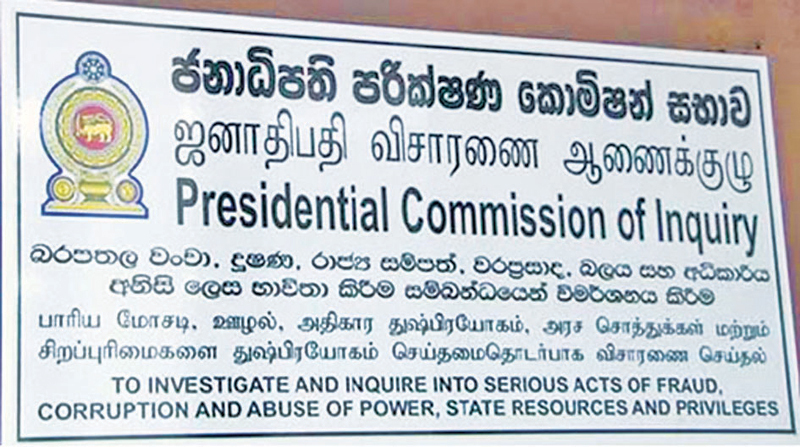 Court of Appeal Judge Gamini Amarasekara yesterday questioned the Deputy Central Bank Governor at the Presidential Commission of Inquiry (PCoI) into the Irregularities at SriLankan Airlines, SriLankan Catering and Mihin Lanka. Justice Amarasekara asked as to who should be held responsible if someone challenged this issuance of bonds in courts when the gazette was issued subsequent to the issuance of bonds. This has been the practice of the Central Bank of Sri Lanka since 1997 than the law.The witness said he had no answer for that. Justice Amarasekara was referring to the issuance of bonds worth US$ 500 million (Around Rs. 46.3 billion) to SriLankan Airlines by the General Treasury as per a budget proposal for 2012 - 2014 period as capital infusion instead of issuing money (cash). Pointing out that the General Treasury through the minister in-charge of finance had not gazetted the issuance of these bonds on a prior date following the Registered Securities Stock Ordinance (RSSO); Justice Amarasekara said the public could have raised their objections against this issuance in courts if it was gazetted as per the law. When Additional Solicitor General (ASG) Neil Unamboowe, PC claimed that Attygalle as the then Deputy Secretary to the Treasury (DST) had directed the CBSL to issue billions of rupees worth bonds to the SLA even without a direction from the then Finance Minister, Attygalle replied that when the budget asked to make such expenditures, he as the DST had to find money for that. Attygalle said they have two options either to borrow money from banks to make the relevant expenditures or issue bonds. However, as it is the public money, they had used the least cost method, he added. Attygalle also said that Dr.P.B. Jayasundara as the then Treasury Secretary had directed him to issue bonds valued at US$ 500 million to SriLankan Airlines instead of money. As the Secretary had mentioned that those bonds cannot be discounted, the ASG questioned the Deputy Governor under which law had he mentioned this. “There is no law to say that. But, this should be because it was issued for capital infusion and not for the recurrent expenditure”, Attygalle added. Some heated arguments ensued between ASG Unamboowe and Deputy Governor Attygalle during yesterday proceedings also and Commission Chairman,retired Supreme Court Judge Anil Gooneratne intervened to control the flares.